Google recently released enhancements to Google Calendar to help users better manage their time. The enhancements includes Out of Office notification and Working Hours designations. You can now create an Out of Office event on your Google Calendar. Google will automatically decline any invitations during the time period. You can create a custom decline message, letting others know you are unavailable for meetings. To colleagues who are using Calendar to find a time for to schedule a meeting, it will be clear when you are unavailable. In Calendar Settings, you can now clearly designate the hours you are available to be in meetings. This setting helps colleagues to not invite you to meetings outside of your designated period of availability. If you are invited outside the specified working hours, the person sending the invite will be notified. Each day of the week can have a unique range of availability. 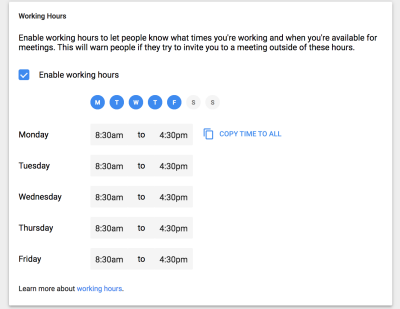 Google will analyze your meeting patterns and suggest a working hours range for you.